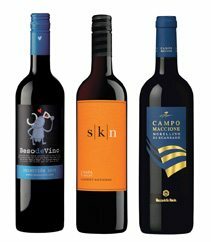 DAVID LAWRASON previews the LCBO’s newest additions. As summer turns to fall and green leaves change to red, so do wine fans shelve their green wines of summer in favour of heartier autumn reds. So we bring you a selection of highly recommended, brand new reds at the LCBO, noting some interesting trends as we go. But first, a trend within the LCBO itself. A breath of fresh air — actually a stiff wind of change — is blowing through the selection process. This year, for the first time, there was a mass one-time infusion of new Australian wines (I wrote about the month-long promotion in Ottawa Magazine’s May 2011 edition, now available online), with similar campaigns slated for other wine-producing countries in the months ahead. But, most importantly, many new, well-chosen, good-value labels are popping up on LCBO shelves on an almost weekly basis. Someone at HQ is buying well — almost having fun, it seems. Here is a mixed case of reds that rate 86 to 89 points, or “very good” in non-numerical speak. But look deeper at the price. The value is often shockingly good, especially out of southern Europe. It’s a good time to be a red wine fan. Bring on fall. Wow, quite a feat to get anything labelled Napa for less than $20 — let alone a good wine! This one wafts lifted, sensuous, dark blackberry, cocoa, coffee, and cedar aromas. It’s medium-to-full-bodied, quite dense, and intense on the palate — more gumption than many at the price. Best 2012 to 2016. LCBO 218834. Great value here, but Cape wines always over-deliver in terms of depth and complexity — if you like their distinctive iodine minerality. This sports a ripe, dark, smoky nose with complex dried fig, cocoa, herbs, tobacco, and a touch of that iodine. It’s full-bodied, fairly dense, firm, and a bit hot. Thinking liver and onions. LCBO 222299. Pinot noir is now mainstream in California, which means lower prices, lower quality, and lower expectations for this once rarefied grape. But this pinot noir delivers, with complexity, richness and, yes, even some finesse. There is some oak mocha character, with pure pinot cranberry-black cherry jam fruitiness, plus maturing leather and meatiness. It’s mid-weight, smooth, and not egregiously sweet. Enjoy with rare roast beef. LCBO 226555. I have tired of cheap, full-flavoured but coarse, hot, unbalanced Argentine malbecs, so I am seeking value through elegance at a higher price. This has a fragrant, lifted nose of blackberry, celery seed, and a touch of leather — more complexity and interest than many malbecs. It’s mid-weight, fairly dense, and smooth, with soft tannin. The length is excellent. Vintages Essentials 079293. Niagara is awash with new, cheap “lifestyle” or “concept” wines. Most are silly and mediocre at best. But this new blend from Henry of Pelham’s red wine specialist Ron Giessbrecht is worth checking out. The nose is lifted and spicy, with flinty, peppery notes overlying blackberry fruit. There is good density, with firm, tartish acidity and gritty tannin. Spicy, smoky notes linger. Although designed for current, casual drinking, it will age a year or three. Red Truck is an offshoot of Sonoma’s popular Cline Cellars. This is a bit commercial, with obvious cinnamon-clove spice and candied cherry fruit. It’s medium-weight, open-knit, rather hot and coarse. But though it lacks some elegance, it is unmistakably California pinot — and tasty. Chill lightly. LCBO 177931. Prices are crashing in Piedmont! This is a ridiculously good price (used to be over $30) for a fine barbaresco. It has a sweet, generous nose of cran-sour cherry fruit with lovely, autumnal, cedary oak spice; fine herbs; and incense. It’s mid-weight, smooth, and almost creamy, finishing with sour-edged tomato gusto and dusty tannin. Set the table with savoury red-meat dishes. LCBO 160143. A modern twist from a classic region: this is a generous, smooth, and easy-drinking rioja, with typical American oak coconut and weathered wood. There is also decent ripe plummy/fresh fig fruit. It’s medium-weight and mellow, with good density. Avoids excessive heat despite 14 percent alcohol. Authentic and approachable. Best now to 2015.LCBO 243097. Robert Parker has rated this 90 points, making it a minor miracle under $10. Well, it’s not that good, Bob, but plunk down $120 for a case, and enjoy this Tuesday-night red for the next three months. This is an 85 percent syrah/15 percent garnacha blend with a sweet, ripe nose of blackberry jam, peppery spice, and char. It’s full-bodied, rounded, loose, and sweet, with chalky tannin and considerable heat. LCBO 231787. Portugal patiently awaits global notice for the good work it is doing for so little money. This offering blends four indigenous grapes from Portugal’s sunny south to create a peppery, syrah-like red with wood smoke, lead pencil, leather, and ripe fig fruit notes. It’s medium-to-full-bodied, soft, and warm but avoids soupiness. Well-composed, complex, and very approachable — especially at $8.95! LCBO 253880. From Tuscany’s warmer south comes a heartwarming red with a bright, generous nose of sour cherry, rhubarb, and background typical sangiovese leathery notes. It’s medium-weight, plump, and soft, with a sour-edged finish and fairly soft tannin. Here’s a wine that cries for pizza. LCBO 253831. A steal at under $10. Made from local aragonez and aromatic castelao, this offers a ripe, sweet, plummy nose with nicely integrated tobacco and leather notes. It’s medium-full and a bit coarse — but not abrasive — with a leathery, spicy, licorice finish. Good to very good fruit density and length. Best 2012 to 2014. LCBO 253864.